When you work for an engineering company and your husband's gaming collection takes up three huge bookshelves, you start to think that everyone around you is a geek. Funny little anecdote: when I first got into Monster Hunter Freedom 2, I spent a lot of time carefully picking out my character's hair style, voice, clothing, and so on (like dressing up a virtual doll). And the more battles I fought, the more I unlocked interesting weapons and armor sets, causing me to spend hours perusing through the blacksmith's shop, plotting my next purchase. 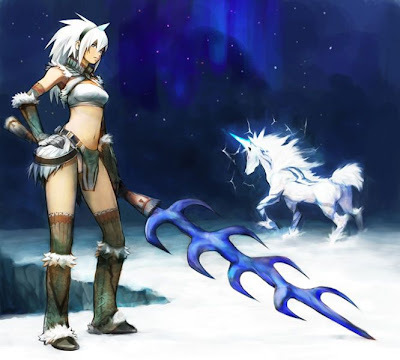 On one particular girls' night out with best friend (and non-gamer) Sophia, I excitedly whipped out my PSP to show her my beautiful creation, decked out in adorable kirin armor (think: white lightning unicorn). Her response was, "Uhhh, you know that's just a game, right? It's not real." I.. what the... how can you... GAAAAAAHHHH!!!! Yes, I know I must sound like a raving four-eyed lunatic with buttons perma-glued to my thumbs, but at least you could have given me a pat on the head and said, "Wow, that's great, honey! What a productive use of 200 hours." ...oh dear, that sounds really bad too.